Join Anna and the Professor as they travel the world in a race to find the seven Tears of Sekhmet! Anna has made her way to the heart of a hidden temple to find the source of Napolean`s downfall. After collecting crucial artifacts to end Nefertiti`s curse, she must now protect them from her stepbrother, who would love to use the power for evil! Curse of the Pharaoh: Tears of Sekhmet is a great Hidden Object game, full of wonder and excitement! Curse of the Pharaoh: Tears of Sekhmet is rated 3.9 out of 5 by 12. Rated 5 out of 5 by upsysydaisy from I Did Not Feel Cursed !! I had lots of fun ! The game had plenty of things to find in every scene, with just enough challenge if you are not into pulling your hair out ! There are missing items and puzzle pieces to find, items to replace back into the scene, as well as 3 gold coins in each scene. There are tools available in the store which can be handy in your quest to find The Tears and solve the mystery. After completing all your tasks in a location, it is permanently closed so no time is wasted returning to a useless area. I appreciate that feature ! I love "Wipi". He gives you an extra hint if you are quick enough to click on him in his very brief appearance, on any edge of your screen. He looks so funny running across your screen, if you ask for a hint. By the way, your hints accumulate if not used. I had MANY of them left at the end of the game. I was delighted to find "spot the difference" puzzles in the game, they have always been a favorite especially if they are challenging. I felt these were of medium challenge. The storyline was good...along the lines of Samantha Swift and Amanda Rose. This was a nice relaxing, innocent game suitable for all ages. Overall a quality little SE that offers entertainment free of monster, demons and witches. It ran smoothly, the graphics were nice, the music did not distract and the subject matter was interesting. I think it is wholesome enough for children to play. I used a coupon but would have felt okay had I picked it up in a sale, or even paid the $6.99. 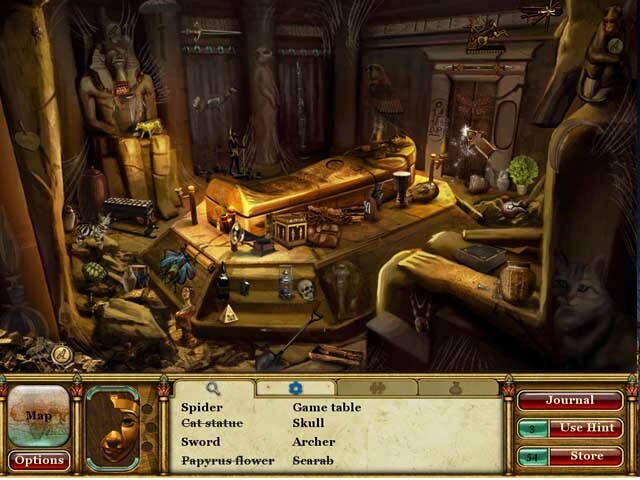 Rated 5 out of 5 by pennmom36 from Curse of the Pharaoh: Tears of Sekhmet Another fantastic Curse of the Pharaoh game with more hidden object scenes than it's predecessor. This game still has "spot the difference" puzzles, plenty to keep those spotters happy, but this game is more of a HOS. Each scene has 3 pharaoh coins to collect which can be used in the store to purchase bonus items such as a double cursor, an extra hint, a big flashlight, a mirror, a hammer and an oxygen mask. Wipi still pops up periodically on the side of the scene and if you "catch" him he gives you an extra hint. You will also need to collect puzzle pieces and find missing items as well as putting those pieces back into the scene where they belong. 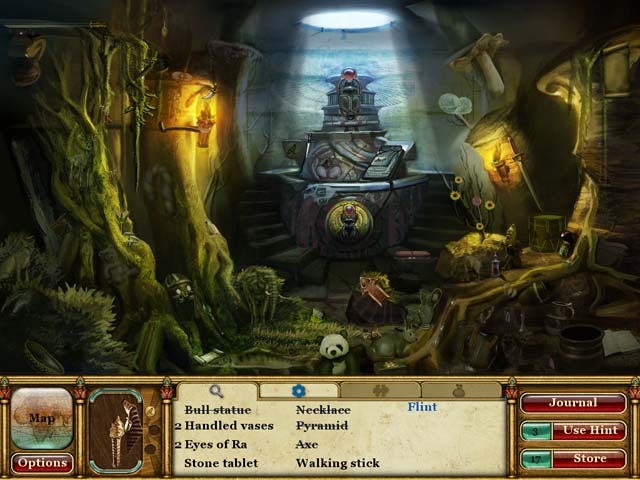 Some of the hidden object scenes are repeated in the same location. At the end of level, you will use the collected puzzle pieces to complete a mini game such as a puzzle that requires you to swap pieces to complete a picture. This is a must play game for Egyptian theme loving gamers, enjoy! Rated 5 out of 5 by hodgepodgespv from but i don't want to bring this series to an end! even as a newbi, i enjoyed this last in the trio. as a newbi i also figured out that i should not buy any games without a walk thru or strategy because if there are not enough or well written instructions about what you are supposed to do, i will go crazy and want to throw the computer. i liked the fact that once a section is complete, it is done so you won't have to find your way back to it a million times. the mini games were equally as fun. 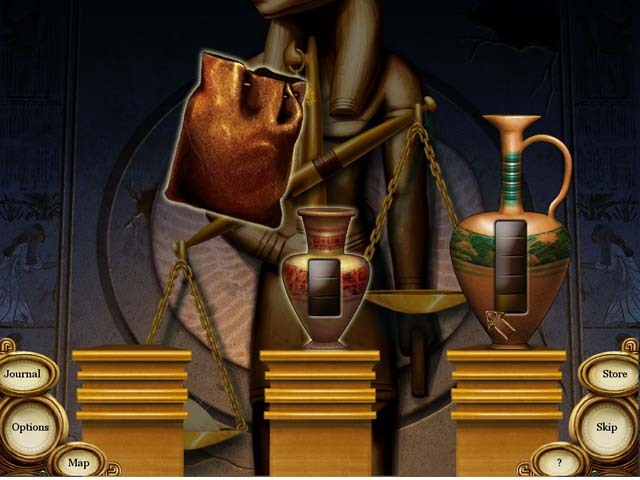 Rated 5 out of 5 by pcpat923 from Curse of Pharaoh Trilogy - Good, Quality Gaming Deserving 5 Stars.A crazed brother deeply affected by an Egyptian curse is the overlying storyline in all three games.. Egyptian artifacts, settings, great music, well lit hidden objects all contribute to the depth of this well-researched game. Napoleon's Secret and Tears of Sekhmet.are the other two Curse of the Pharaoh Trilogy. More fun stuff going on such as finding coins to make store purchases, using tools in scenes and clicking on "Wipi" who pops in at the screen edge, for extra hints. Great games for all ages. BFG could sell these as a trilogy combo pack as I purchased separately during their awesome Sale but would not have otherwise. Thanks for the great Sale BFG! Rated 4 out of 5 by Eveoflove from Final chapter of the trilogy Review based on completed game. This last chapter of the trilogy begins when the previous game ("Napoleon's Secret") ends. Anna, the professor and Will are involved in more (mis)adventures. This is my favorite of the series because it has a much larger proportion of HO compared to the "spot the 10 differences", especially compared to the 1st game. They also stopped having those twinkles to help you find things: you'll have to use hints if you can't find everything, but Wipi is there, more frequently than before, and he stays on screen for a couple of seconds more; I only missed clicking on him a few times because I was too focused on a portion of the scene. I love the fact that you can NOT accidently "close" a scene and miss out on the 3 coins or the mask piece: the game knows you're not done. 9 worlds once again, each with 4 or 5 scenes that you'll visit typically twice (though some objects are "re-arranged") before accessing the mini-game level searching for 1 of the many "Tears of Sekhmet" to gain ultimate power; this time around, the pharaoh's masks are not the same in each world... a welcome improvement. I did find the graphics less sharp and probably used 20 hints altogether; no worries, I still had more than 50 to spare when I completed the game (I still can't believe I couldn't find the giraffe!) Not a very difficult game, but many objects are small and because they are hand drawn, somewhat difficult to identify; thankfully, no misclick penalty (unless you click like mad and end up having to use only a flashlight as your short-term punishment.) Try the game for a few scenes and you'll get a good idea of what to expect. I played the game using Windows 10 without any issue, and plan to play it again in a few years. Rated 4 out of 5 by grapeleaves from Strain your eyes again.!!!!! It's a good game. Sorry to say the objects so hard to see. I done want to get a headache. My eyes got totally tired. Hints few a far between. Rated 4 out of 5 by arnold1049 from BEST OF THREE This is by far the best of this 3-game series. Thankfully, there were very few spot-the-difference scenes and many more HOS, which should be since it is advertised as a HO game. The game was somewhat harder than the previous two games. The pop-up for extra hints was finally slowed down to the point that I was actually able to click on it to get the extra points. I had to refer to the walk-through once, when I couldn't figure out how to start one of the mini games. And I used a lot of hints on some of the darker scenes and when I got inpatient, which is one of my problems when playing games. All in all a good game. Rated 4 out of 5 by FORTUNATUS from Tombs (uh, TONS) of fun!! This game is filled with adventure and fun and a must-try H0G adventure/mystery. You will find lots of reward not just in the pleasure of playing the game itself, but built directly into the design of the game; ie. levels you gain in advancing through the adventure and solving the mystery, collecting the tears, as well as actual awards you gather along the way (coins which you collect and use to purchase items which can assist with gameplay). How cool is that!? It really is not run of the mill at all and you must give it a try if you enjoy immersive H0G... GREAT GRAPHICS GREAT SOUND Curse of the Pharaoh: Tears of Sekhmet is a TON of FUN... (errr, just don't ask me to pronounce "Sekhmet", let alone spell it without looking, haha). :) Have fun! Rated 4 out of 5 by Rebr2009 from Great Trilogy I really like the Pharaoh's Trilogy. Good Atmosphere, great music, nice graphics, and a lot of things to do: collect coins, earn extra hints, several and funny puzzles, besides the HOS, that are very clear. A very good way to relaxing and having fun. Travel the world in a race to find the seven Tears of Sekhmet! Unravel the mystery of Nefertiti`s curse and bring it to an end!